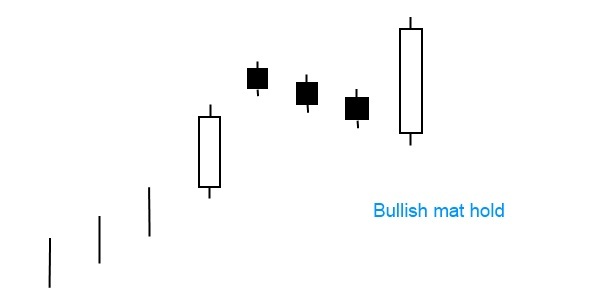 In the bullish mat hold pattern the first candle is a long white candle, followed by three days in a slight downtrend. The fifth day then continues the first day’s growth, reaching a higher closing price than that of the first day. This pattern shows that the stock will continue its previous rising trend. It’s a rare but reliable sign. The bullish mat hold is quite similar to the rising three method, they can be easily mixed up. The situation of the three middle candles makes the difference. In the rising three methods pattern, the length of the first candle encompasses the small black candles in the middle. Contrarily in the bullish mat hold pattern, these middle candles are higher. It has a similar bearish variant the bearish mat hold formation.